Captivating Design. Unlimited Performance. Unmatched Entertainment. Our first-ever Moto G with a head-turning metal design gives you more than you’d expect for less than you’d think. Free yourself with a 2800mAh all-day battery and rapid charging. * Take beautiful photos even in bright light with a fast-focusing 13 MP camera. Stay entertained on the go with a fast 1.4 GHz octa-core processor. * Unlock your phone using only your fingerprint. And turn on the camera with a twist of your wrist—our exclusive Moto Experiences give you simple shortcuts to the features you use most. Precision crafted from high-grade aluminium and bead-blasted to perfection, you’ll love the stunning good looks of the new Moto G5. Choose from Lunar Gray or Fine Gold colors. With an all-day 2800 mAh battery, go from morning to night without plugging in. And when it’s time to power up, don’t slow down. The included 10W rapid charger gives your Moto G5 hours of power in just minutes. The 13 MP camera on Moto G5 includes phase detection autofocus (PDAF), which enables fast focusing for sharper pictures. Switch to the front camera, and there’s a 5 MP wide-angle lens designed for group selfies. Improve your selfies by smoothing the skin to reduce blemishes or wrinkles. Choose the Beautification Mode manually, or have all of your selfies beautified automatically, so you always look your best. Never miss a moment. Launch the main camera quickly with just two twists of your wrist. Then double twist again to switch to the front camera. Take a picture and the camera automatically captures multiple shots, intelligently recognizing issues like blurred images or closed eyes. Then it recommends the best shot to keep, so you get the best results. Get ultimate control by using the same manual settings you’d expect to find on a professional SLR camera. Adjust the white balance, shutter speed, ISO, exposure compensation and focus. Never mind remembering your passcode. Just use the fingerprint reader to unlock your phone and wake it up instantly. Touch the reader again to lock it back up. Enjoy music, movies and games on the go with a fast 1.4 GHz Qualcomm Snapdragon 430 octa-core processor*, powerful graphics capabilities and support for 4G LTE. Run apps smoothly without slowing down. Get stutter-free playback of your favorite games and videos. And browse the web or stream music at lightning-fast speed. Bring your photos, videos and games to life. 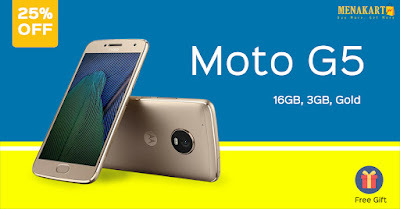 Moto G gives you a 12.70cm (5”) Full HD display (1080p / 441 ppi), delivering the vivid colors and fine details you’ve come to expect only from premium phones. Never let spills, splashes or a little rain get in your way. Moto G uses a water-repellent* coating to protect your phone inside and out. This advanced nano-coating technology creates a water repellent barrier to help protect against moderate exposure to water such as accidental spills, splashes or light rain. Don’t jump through hoops to stay in the loop. Moto Display gives you a quick preview of notifications and updates, so you can see what’s going on without unlocking your phone. With Moto Actions, your simple gestures make everyday interactions more convenient. Whether it’s a twist of your wrist to open the camera or chopping down twice to turn on the flashlight, you can use your favorite features without touching a button. Having one phone doesn’t mean you have to stick to one plan. Or even one number. To help save money, Moto G automatically selects the best plan to use based on your call history. You can also manually switch between two plans to keep business and personal calls separate.